Given a circle with the radius of 9.42ft. Find the circumference of this circle. Take π as 3.14. 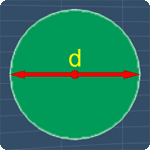 The picture below shows the circle with the diameter d.